Last week, we interpreted the behavior of the EURUSD pair as bearish. This week, a number of things have come together to create a critical point on the technical chart (Daily chart, above). 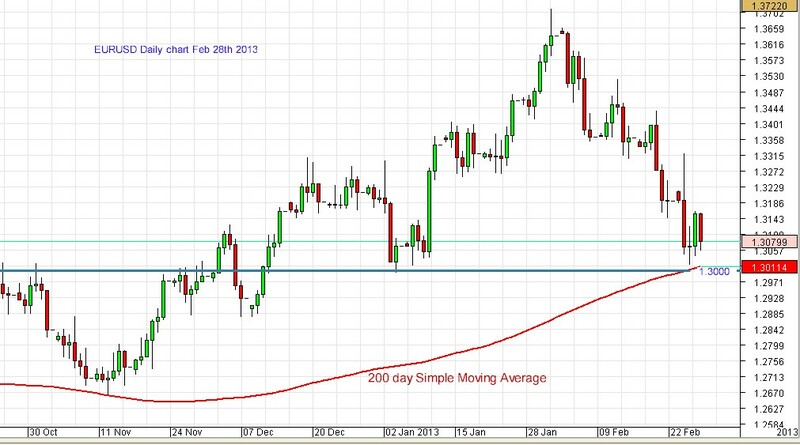 Today is the last day of the month; the 200 day Simple Moving Average (SMA) has been recognised by the market as a support, as it often is; and the psychologically significant 1.30 price level is now on the radar, also as a support level. A fairly well defined bearish head and shoulders formation is in evidence too. Fundamentally, while nothing has changed with regard to the challenges the Euro faces, Mr. Bernanke in the US seems to have somewhat moderated the indications given in the last released Federal Reserve minutes about the possible ending of Quantitative Easing (QE), which tends to continue the propensity of the US dollar to slide (for the EURUSD pair to strengthen). Make no mistake, though, if the pair sustains a break through the support levels indicated above, the bearish trend will be well and truly established. The Omicron Forex SilverTRIGGER Algorithmic trading tool has had an excellent first two months of 2013, trading EURUSD and AUDUSD.